Supporting you in helping your children learn and enjoy mathematics from birth to age five. The California Mathematics Council (CMC) believes the first five years of children’s lives are a critical time for learning, and that parents play a critical role in supporting their children’s earliest mathematics learning. CMC wants to help parents give young children their first positive experiences in mathematics. 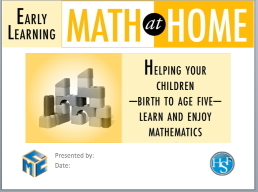 The booklet, Early Learning: Math at Home, and this webpage are CMC's way of supporting families—and organizations that work with families—in our efforts to give young children a wonderful start in learning mathematics. The CMC professional development committee developed PowerPoint slides and agendas for organizations to use with their communities. This preK guide to mathematics education was written expressly with parents and guardians of children, birth to age five, as the primary audience. We ask your help in sharing Early Learning: Math at Home and its individual PDF articles, with the families of preschool, daycare, and children’s centers that you know and work with. Help the California Mathematics Council improve mathematics learning for all children! Click on individual articles to download them. A full copy of the booklet in English and Spanish can be downloaded for free. Print copies can also be ordered.